In order to meet the growing demand for medical devices, fluoropolymers are being used on a large scale owing to its good dielectric properties, lubricity, and biocompatibility. They are also being largely used for developing biomedical materials for heart valves and artificial corneas. Replacing many of the plastic products in the medical devices, and the healthcare industry, the fluoropolymer is emerging as one of the largely used material. Having various unique properties such as low coefficient of a fraction, and high resistance to chemical and heat, fluoropolymer is also used as a substitute bone for ear, hip, skull, knee, and nose parts. Major players in the market are also focusing on developing recyclable and eco-friendly fluoropolymer, hence this is resulting in the growing popularity of fluoropolymer in the healthcare sector. According to a study by Transparency Market Research (TMR), the global market for fluoropolymer is likely to witness a steady growth, registering 5.3% CAGR, during 2017-2026. The global market for fluoropolymer by 2026 end is also projected to reach US$ 690.3 million revenue. Polytetrafluoroethylene is likely to emerge as one of the top-selling products in the global market for fluoropolymer. By 2026 end, Polytetrafluoroethylene is projected to surpass US$ 300 million revenue. Polytetrafluoroethylene is being widely used in microporous membranes, acting as a filter for bacteria and particles in critical fluids. There has also been an increase in the use of Polytetrafluoroethylene as a graft material in surgical interventions. It is also used as a coating on catheters, as it helps to stop infectious agents and bacteria. 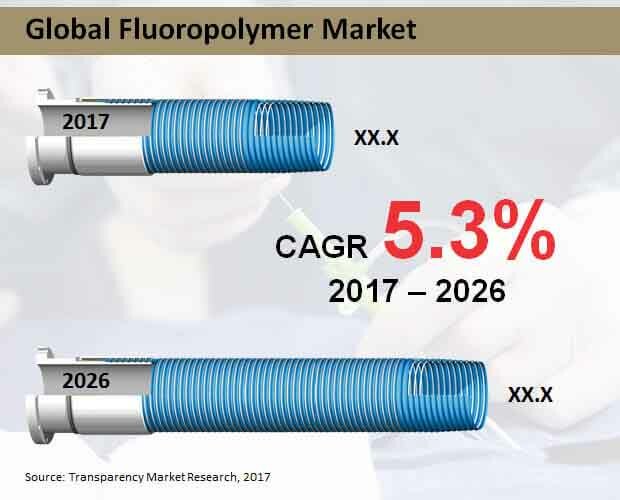 Fluoropolymer is likely to find the largest application in medical devices between 2017 and 2026. Witnessing a robust growth, medical devices are projected to bring in more than US$ 300 million revenue towards 2026 end. There has been an increase in the replacement of plastic material with fluoropolymer material for manufacturing medical devices. Also, fluoropolymer meets the next generation medical devices biocompatibility and physical requirements. Medical device manufacturers are using fluoropolymer to produce various devices including syringes, catheters, bio-containment vessels, and sutures. Being heat and chemical resistant, fluoropolymer is also being used in the production of multilumen tubing and also to produce devices used in the minimal invasive procedures. Asia Pacific Excluding Japan (APEJ) is likely to be one of the largest regions in the global market for fluoropolymer during 2017-2026. Being the largest producer and consumer of fluoropolymer, APEJ is likely to witness growth in the coming years. Moreover, owing to the increase in manufacturing activities, availability of land, labor, and various raw materials including ethylene, and fluorocarbon at low price, the region is anticipated to experience significant growth during 2017-2026. The demand for fluoropolymer is also increasing in countries such as Thailand, Indonesia, and Vietnam owing to the development of healthcare sector. Meanwhile, North America is also likely to witness growth in the use of fluoropolymer material in the healthcare sector, especially in the medical devices, pharmaceutical packaging, and drug delivery. Leading players in the global market for fluoropolymer are 3M Company, Asahi Glass Co., Ltd, Honeywell International Inc., Solvay SA, Daikin Industries Ltd., E.I Dupont De Nemours and Company, The Chemours Company, Zeus Industrial Products Inc., Compagnie de Saint-Gobain SA, W. L. Gore & Associates, Inc., and Mexichem S.A.B. de C.V. Presence of limited number of players are leading to the intense competition, hence companies are focusing on research and development activities to stay ahead in the competition. A fluoropolymer is a polymer that consists molecules of fluorine and carbon. Being a high-performance plastic material, the fluoropolymer is used in high temperature and harsh chemicals. In the healthcare industry, the fluoropolymer is used on a large scale for packaging of medical liquids and sprays. Owing to its superior characteristics, the fluoropolymer is used over other plastics for packaging application. Companies are focusing on developing new solutions and finding out the new application of fluoropolymer. Fluoropolymers, especially PVDF and PTFE are being used in microporous membranes. The environment-friendly fluoropolymer is also being developed by manufacturers, hence, increasing number of research activities are being carried on by manufacturers. Various properties including chemical resistance, ability to perform at high temperature, is allowing companies to focus on innovative designs using fluoropolymer instead of plastic. The global fluoropolymer market report provides a detailed insight into the various factors impacting the growth of the market. The report also offers information on various trends and opportunities along with the major developments in the market. Information on latest technology and competitors in the market are also given in the report. A comparative analysis and forecast on various segments are also been provided in the report. The report offers information on the major factors that have an impact on the growth of the market. Major industrial developments along with innovative technologies have also been given in the research report. The report offers information on market dynamics including opportunities, trends, drivers, and challenges. Market attractiveness analysis, SWOT analysis, and Porter’s five force analysis are also provided in the report. The major industrial developments given in the report are based on the events that took place in the past and the events that are expected to take place in the future. The report also includes information on the leading companies operating in the global fluoropolymer market. Both primary and secondary research has been done to draw various conclusions in the report along with an in-depth analysis of the market with inputs from the industry experts. The global fluoropolymer market is segmented into product, application, and region. On the basis of product, the market is segmented into polytetrafluoroethylene, polyvinylidene difluoride, fluorinated ethylene propylene, and other products. On the basis of application, the market segment includes pharmaceutical packaging, medical devices, drug delivery, and other applications. Region-wise, the market is segmented into Asia Pacific Excluding Japan (APEJ), Europe, Latin America, North America, Japan, and the Middle East and Africa (MEA). The report also offers a country-wise forecast for each segment, along with the market share and CAGR in the percent form for the forecast period 2017-2026. The report provides a detailed profile on some of the leading companies in the global fluoropolymer market such as Solvay SA, E.I Dupont De Nemours and Company, Asahi Glass Co., Ltd, 3M Company, Daikin Industries Ltd., Honeywell International Inc., The Chemours Company, Mexichem S.A.B. de C.V., Compagnie de Saint-Gobain SA, W. L. Gore & Associates, Inc., and Zeus Industrial Products Inc. The leading companies in the market are evaluated on the basis of various parameters including strategies, product portfolio, financial overview, company overview, and key developments.